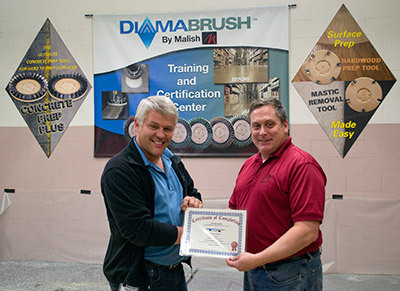 May 2013 – The Malish Corporation, a global leader in the design and manufacture of floor machine and surface cleaning brushes since 1948, recently conducted its first Diamabrush Training Seminar at the corporate headquarters in Willoughby, Ohio. The seminar is an intense 2-day session that includes classroom training in the new Diamabrush By Malish Training Center and hands-on training and experience in the demonstration area, which includes a variety of surfaces from concrete to wood. Diamabrush By Malish is a unique diamond abrasive floor preparation system for concrete floor polishing, mastic removal and hardwood prep.